Current and emerging technologies are revolutionizing in-home care delivery for seniors. This is especially promising for the nearly 90 percent of baby-boomers who want to "age in place," remaining in their own homes as long as possible. Advances in technology are delaying, and in some cases eliminating altogether, the need for seniors to transition to assisted-living or nursing facilities. Digital capabilities not only maximize independence, but also help older consumers and their clinicians and caregivers monitor their health, resulting in fewer doctor visits and hospital stays. In the coming decades, these trends are expected to gain momentum. GPS-tracking and sensors placed throughout the home allow caregivers to keep tabs on their loved ones' whereabouts and daily routine. Sensors are connected to a wearable device that enables the user to summon help in an emergency. These devices can also alert family members when the older person doesn't get out of bed, has fallen or wandered off, or hasn't eaten in awhile. This technology is especially beneficial for caregivers of dementia patients. Family members can be notified via their smartphones if the elder exhibits behaviors that are out of the ordinary or could put him in harm's way. An array of products are currently on the market that can help older people manage housekeeping and maintenance routines. Robotic appliances can perform house cleaning tasks like mopping, vacuuming and scrubbing floors. Electronic devices are also available to assist with outside chores, cleaning everything from grills to gutters or mowing the lawn. Those with sensory or mobility limitations can access apps and assistive devices that enhance their independence and quality of life. A considerable number of seniors struggle with one or more chronic conditions, so having access to quality healthcare is essential. New paradigms in healthcare recognize that the "point of care" isn't just a clinic or hospital setting, but wherever patients are. This extends to the realm of homecare. Automatic pill dispensers and apps that issue reminders about medications and doctor appointments are just two examples of innovations that make it easier for seniors to manage their health independently. Likewise, devices that track important measurements, like glucose and blood pressure, can help patients monitor their conditions between appointments, possibly minimizing emergency room visits. Devices that allow patients to track their health status can be synced with smartphones and other mobile technology, allowing caregivers to relay critical information to clinicians, who can use analytics to detect potential problems before they become serious health concerns. Enhanced digital technology has made remote healthcare services more readily available. Video capabilities allow clinicians to communicate with patients and caregivers as if they were face-to-face. Telemedicine is especially advantageous for older people who can't easily travel to medical appointments. Doctors can interact directly with patients and share reports with caregivers and other providers in real-time. Caregivers can access test results and prescription information anytime, from any location. Automation improves data quality and collaboration between providers, enhancing the continuity of care. These integrated capabilities have the potential to double the accessibility of healthcare for older consumers. New technologies, and improvements to existing ones, will prove invaluable for seniors. In the coming years, those who reach their golden years will be more tech-savvy than past generations of older people. Thus, they'll be in a better position to take advantage of innovations that optimize their capabilities and give them access to homecare and healthcare services that are better-coordinated than in the past. With such a large segment of the US population reaching retirement age, it's expected that home design will become more senior-friendly, with built-in amenities that accommodate physical and sensory limitations. These modifications will combine architectural adaptations with evolving technology to provide helpful features such as lights that turn on automatically when someone gets out of bed in the middle of the night. It may be a matter of course for homes of the future to be equipped with sensors that alert you if you've left outside lights on or failed to lock the front door. Seniors may also have access to "gadgets" that help them find frequently-misplaced items, like the phone, TV remote, or keys. Amid demographic shifts and rising costs, providers will have to leverage available resources to provide high-quality services that meet patient's' expectations. Because of their versatility, emerging and existing technologies can be easily adapted to align with evolving healthcare trends to provide value-based care that is tailored to each patient's unique circumstances. As people live longer, there will be a greater need to serve a larger population of patients with multiple chronic conditions. Technology will play a pivotal role in augmenting the ability of homecare agencies to offer well-coordinated, person-centered care. Digital developments will enhance the capacity of home-health agencies to provide skilled nursing care that formerly was available only at a hospital or rehabilitation center. 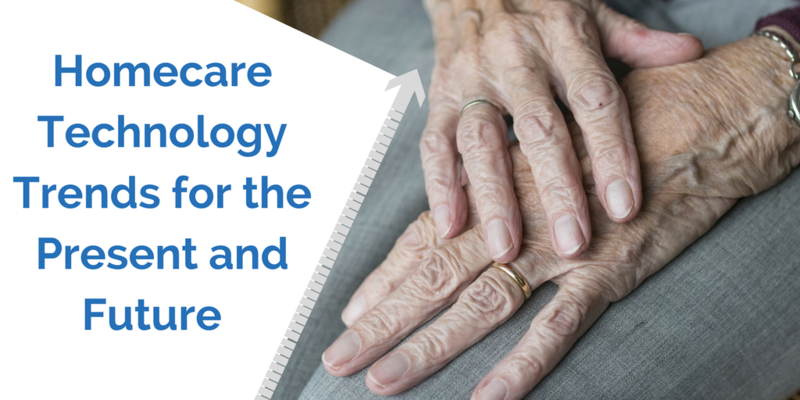 Technology will enable homecare providers to partner with primary care physicians to better assist seniors in accessing community-based healthcare. Caregivers' ability to collaborate with home-healthcare providers to deliver customized and preventive care is expected to further minimize incidents of hospitalization or institutionalization, reducing costs. To accomplish these goals, it's anticipated that, in the coming decades, we'll see a significant increase in the number of healthcare-oriented apps and sensors available to help seniors monitor their conditions and receive specialized home-based care. Diagnostic tools that once could be found only in clinical settings may become available to in-home care providers. Estimates predict that by 2020, seniors will make up 17 percent of the US population. Increasingly, technology is helping older people remain as independent as possible while receiving support services at home. More than ever before, digital advances are allowing seniors to age in place with dignity. In future years, that trend is expected to continue, with technology improving access to health and homecare services and increasing the quality of care delivery. Here at Bluebird we are staying on top of the constantly growing and changing homecare industry, so if you think it’s time to consider in-home care for your loved one, contact Bluebird with confidence. We will provide you with a free, no obligations homecare consultation. We’ll help you figure out your options and find the right solution for your loved one.